Bradley Racing Stable & Indian Ridge Farm is at Indian Ridge Farm / OTTBs / English Riding Lessons. 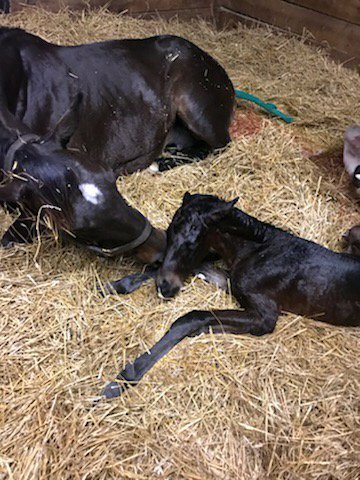 Up and Away just had a nice filly by Get Stormy. Thank you Kim Bradley and Maria Kabel. -A first foal for dual Group 1 winner JACK HOBBS, a filly bred by Nicholas Jones of Coln Valley Stud out of the 4-time winning 124-rated hurdler Cinderella Rose Cherry(Midnight Legend). We are very happy to share with you Almanzor’s 1st foal. @TomRyanKY@CambridgeStud. A filly o/f the Pivotal mare Quara born at Etreham. Well balanced with a lot of quality. We look forward to seeing yours! First foal for El Kabeir! A colt out of the GSP Bushranger mare Shes Ranger. I wonder if this El Kabeir will turn grey? There is a 2018 colt listed for this pairing but doesn't say the color. 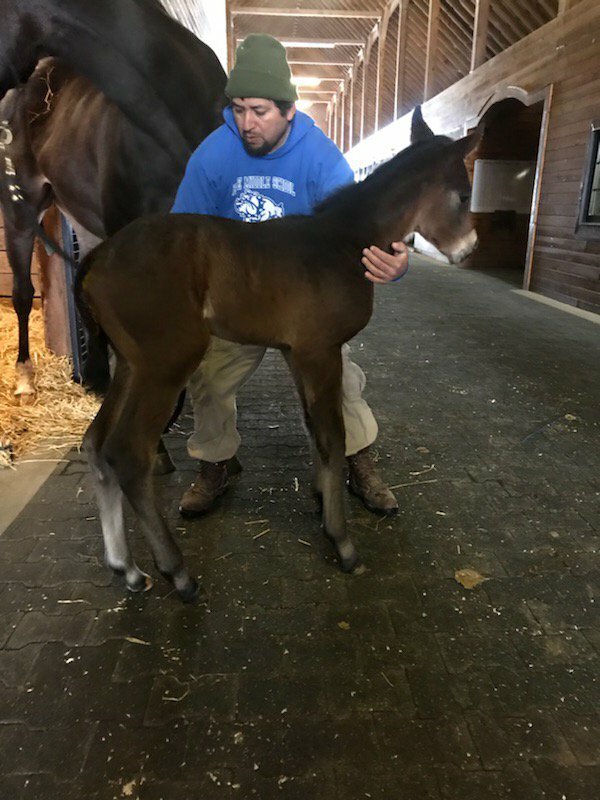 Filly by Flintshire out of Rexy (Teofilo), born at 11:30 A.M. today at Ramsey Farm. Nice turfy pedigree. We're so lucky to glimpse a little spitfire in the making each new year. This thread always picks me up every day! I don't think that's possible, as El Kabeir just entered stud last year. Yeah, anyone can put something on that site. If you can't confirm it with info from a JC/Equineline site, it's probably not accurate. Ah but how gorgeous would he be if he stayed that seal bay color with those cute little tiny half-socks??? If it was my colt I'd be crossing my fingers he stays dark.